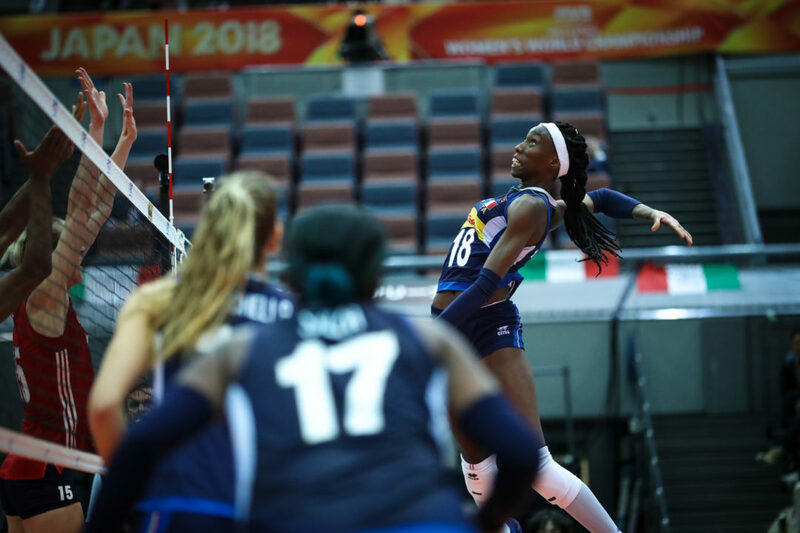 Behind another impressive performance by Paola Ogechi Egonu, 7th-ranked Italy stayed perfect (9-0) with a 4-set upset victory over the 2nd-ranked United States. The Italians used a 15 to 7 blocking advantage and 6 to 2 serving edge to secure the win. Egonu could not be stopped, as she tallied 33 points on the night with 25 kills, 5 blocks and 3 service aces. Miryam Fatime Sylla also had a strong performance for Italy, contributing 22 points on 16 kills, 4 blocks and 2 service aces. Team captain Jordan Larson led the Americans with 14 points on 14 kills. Kimberly Hill followed with 12 points on 11 kills. Despite the loss, the United States were able to qualify for the 3rd round after China topped Russia. Top-ranked China ended 5th-ranked Russia’s hopes of advancement with a 3-1 victory Thursday night. The Chinese limited errors to 13 and outperformed their opponent on the block (14 to 3) and at the service line (12 to 7) to send the Russians packing. China used a balanced attack to earn the win, as 4 players contributed double figure point totals. Ni Yan led the way with 16 points, followed by Xinyue Yuan (15 points), Xiangyu Gong (14 points) and Yingying Li (14 points). The Russians had 2 25-point scorers in Irina Voronkova and Kseniia Parubets. China, which secured its 3rd round berth on Wednesday, moves on with an 8-1 record and 24 points. Russia, which won World Championships in 2006 and 2010, exits the tournament with a 6-3 mark and 13 points. 12th-ranked Turkey rattled off 3-straight wins after dropping the opening set to overcome 16th-ranked Thailand in 4 sets. The Turks outperformed the Thais on the block (17 to 5) and at the service line (8 to 5) to cap their FIVB Women’s World Championships appearance with a win. Turkey was led offensively by Meryem Boz, who contributed 24 points on 19 kills and 4 blocks. Joining her in double figures were Erdem (16 points, 10 kills), Zehra Gunes (16 points, 5 blocks) and Meliha Ismailoglu (13 points, 10 kills, 3 service aces). Sittirack Onuma (16 points), Apinyapong Wilavan (13 points), Kanthong Malika (11 points) and Nuekjang Thatdao (10 points) led the way for Thailand, which continued to miss injured starters Kokram Pimpichaya (knee) and Kongyot Ajcharaporn (ankle). Moksri Catchu-On (ankle) appeared just once in the 4th set. In its final match of the 2nd round, 17th-ranked Bulgaria secured a sweep of 24th-ranked Azerbaijan Thursday night. The Bulgarians played low error volleyball (11), served up 10 aces and posted a 10 to 9 edge on the block to earn the victory. A trio of Bulgarians registered double-digit point totals to close out the tournament with a win, including Miroslava Paskova (13), Ruseva (12) and Nasya Dimitrova (11). Polina Rahimova of Azerbaijan led the way with 16 points, followed by Odina Aliyeva, who notched 7. Bulgaria closes the tournament with a 4-5 mark, while Azerbaijan finishes with a 2-7 record.